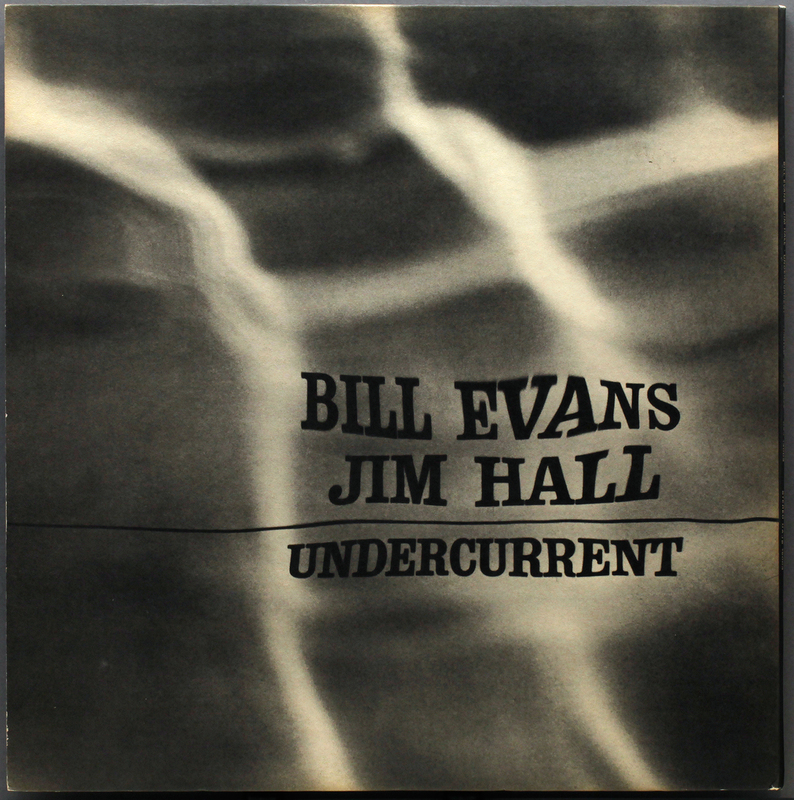 A triumph for Bill Evans and Jim Hall, another exercise in telepathic communion, intertwining piano and this time acoustic guitar in away I’d not previously experienced. 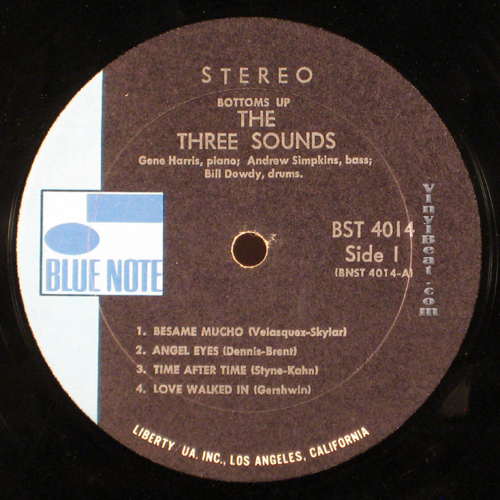 Recorded the year following the death of Scott Lafaro, in which Evans must have been searching for new partnerships before settling for trio format again, Chuck Israels bass, and later, Eddie Gomez. Jim Hall manages to fill the role of solo guitar melody, chordal counterpoint, percussion, and bass, all in one. It is a remarkable recording that should sit on the shelf of every Evans fan, and for some reason it wasn’t on mine. Ah, that would be because I had’t got it. Easily remedied, Ebay to the rescue. I couldn’t understand why most copies offered on Ebay showed the cover seen right, not the eerie lady in white floating below the surface. (A friend described the floating lady almost like a “modern” cover. I think he meant that as a compliment). Others thoughts on that cover here. The original photograph in HD by fashion photographer Toni Frissell of a woman floating in the water at Weeki Wachee Spring, Florida was published in Harper’s Bazaar in December 1947. Opening the record mailer yielded an unexpected surprise because the cover is a … gatefold!! You get both covers. Despite being a committed mono fan, I have always wanted my Bill Evans in stereo . All my UK Riverside Bill Evans are mono. With just two players intertwined like Evans and Hall, stereo has to be the way to go. And beautiful stereo it is. And the decision to go the extra mile for original vinyl in stereo fully vindicated. And the cover is a marvel. United Artists Jazz matrix code formats are unknown to me – I have no more than one or two. But this for future reference is what you find in the run out. The liner notes are a piece of literary fiction – a cross between Mike Hammer’s Mickey Spillane and William Borroughs cut up beat poetry. Perhaps Nat Hentoff, Ira Gitler, and Leonard Feather were busy that day. It asks to be read in a Brooklyn accent, or La-di-dah Greenwich Village, and has dated in a way the music has not. I had taken a couple of years rest from the hype and overgrading of some US ebay sellers, but reluctantly, I had to go to a US seller to find this record, as there didn’t seem to be any copies in Europe. No doubt someone will post in to tell me they have seen hundreds, selling for sixpence. People do that, to cheer you up. I had seen the bendy tenor United Artists Jazz label only once before, and possibly giant United Artists didn’t feel they needed a licensing arrangement outside the US. Since Evans was signed to Riverside, then Verve, I do not understand why this release appears unusually on United Artists. Ten days later, the postman called. From its description, I would guess the record had not been play-graded. It certainly looked “perfect” but the vinyl had persistent crackle. Not scratched, not hissy, but it crackled, more than you would want. Last resort is to return the record, first however random crackle is usually a symptom of unwanted residue in the grooves. Enter the Vinyl Scrubbers! Four sequential record cleaning machine cycles, one cycle with my usual alcohol-based cleaning fluid (British Audio Products – 3 parts distilled water 1 part isopropyl alcohol) , followed by three cycles with non-alcohol based cleaner which targets mould-release on new vinyl (Disco-stat). After each cycle the crackle reduced, to the point where it is now fairly inconsequential, but it was very persistent. “Factory fresh” and ” near mint” tells only half the story. As for renewing the Special Relationship, so far, so good, but I am sure that a record from Hell (Michigan) is still just around the corner. Don’t you just love blogging? Katharsis suggests it may be a Plastylite pressing. Mattyman pops in a reminder to check when I am back home. I snoop around Popsike while at a loose end in France, and as a result I find one auction result with the magic words, ” ear”! Ruddy Hell!! Its all too much, thanks guys, time to open a bottle of Cotes de Rhone. Great here of course because CdR should be drunk at room temperature, which in the Med right now is 27°C. N i i i ce! Cheers! UPDATE no.2: (31/07/12) The stereo, or at least my stereo, has no Plastylite ear in the runout. Perhaps the mono was pressed by Plastylite and the stereo pressing job went to another plant. Another thing I noptice is that some sellers of these “bendy tenor” AU records downgrade to VG condition because of many clicks and pops. That is where mine started from but around 80% of this have been eliminated by intensive “professional” cleaning. My surmise is the factory that pressed them operated poor environmental cleanliness practices. No other explanation. 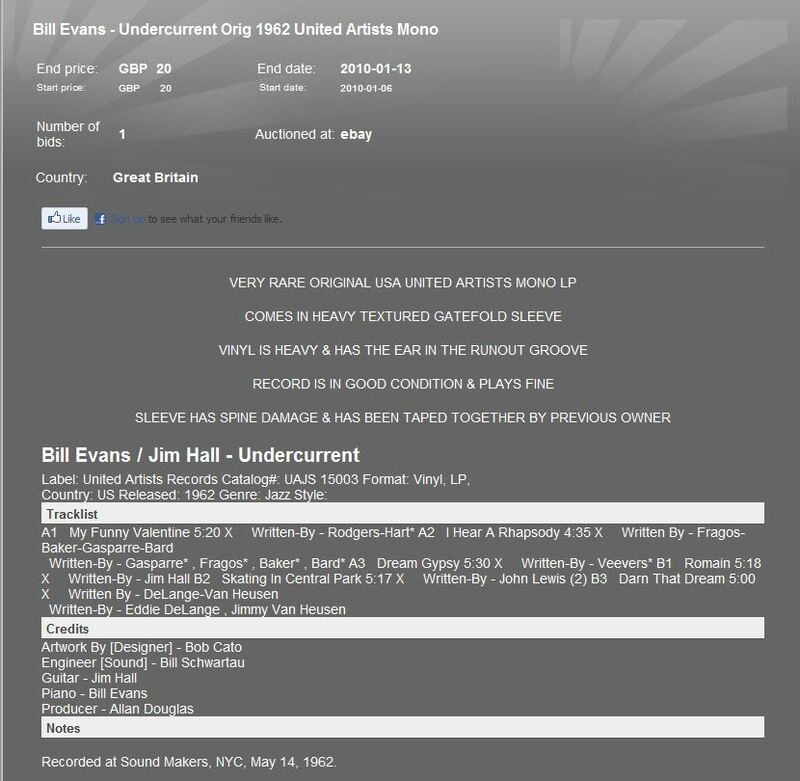 This entry was posted in Bill Evans, Jim Hall, United Artists and tagged Bill Evans, Jim Hall, Undercurrent, United Artists by LondonJazzCollector. Bookmark the permalink.
) I’m going to return once aain since I bookmarked it. 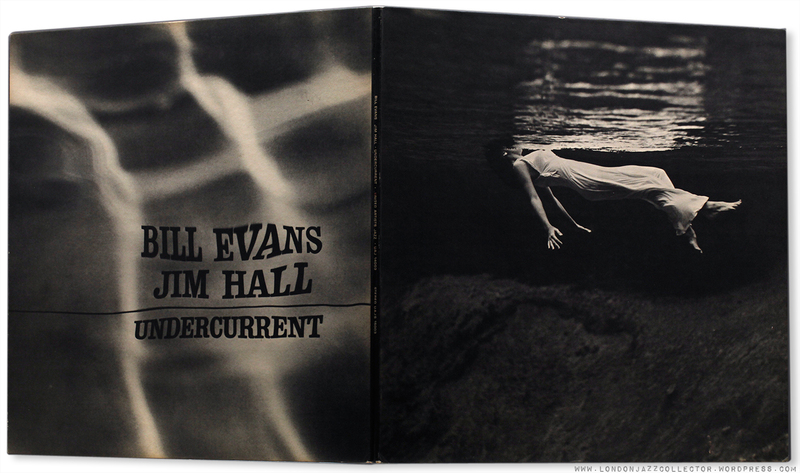 Jim Hall: Undercurrent (1962) United Artists . that I’ve thought it was. Many content interesting and well written . Do you really promote some everyone website writing employees with us? It’d come in handy too in this endless paper documents creating for faculty . Another rather nice pressing of Undercurrent is the Solid State from 1968 SS18018 in Stereo. 180 Gms and superbly engineered. .
Found ears on U.A. Jazz 15006 (Jerome Richardson Qnt), but none on 15013 (Zoot Sims in Paris). I don’t believe this album was made to be listened to,in stereo. Just an opinion,and not a qualified one,as I’ve never heard the stereo pressing. confirm Jakob’s matrix data, and add Plastylite ear, both sides. beautiful mono issue: my preferred cover ever. hi guys, any feedback on the mono UAJ 14003 pressing? What feedback are you looking for? I just did a needle drop of it with my new DL-102 mono cartridge, it sounds fantastic to me. I ripped Intermodulation (promo, mono pressing) too. See LJC’s latest thoughts on the not-at-all-compressed Jpn Toshiba reissue. The earlier stereo versions do sound boxy and clipped. I just recently got my hands on a stereo original of this record and I found that I had the exact same issue with crackle. I haven’t cleaned mine as extensively, but the gentleman who owned the record was pretty meticulous about how he handled them. He bought it new in the 60s and there’s not a mark on it. Yet, I get quite a few pops and crackles that stand out. Combine that with the fact that my receiver doesn’t have much power to it, so I’m cranking the volume, and unfortunately a rather quiet intimate affair has some incidental noise to it. Yet, I really dig how Jim Hall’s comping really pops out during Bill Evans’s agile solo on “My Funny Valentine” on the vinyl…totally worth a little noise. Wow, great thread, but I am very late getting here. I have a mono “bendy tenor” with the ear. One thing you do not mention here that confounded me when I bought it is the spine, mine lists both versions! with a long space before the word STEREO. Yet the inside left cover has a large UAJ 14003, so I presume it is not the same cover for both, but maybe same somehow for the spines, the artwork was done once? Is your inside left showing UAJS 15003? Also, boasting tag on, I have a yellow-label Verve “Disc Jockey Copy Not For Sale” mono pressing of the companion LP “Intermodulation”. Two of my favorites! I found a mono version today and there is a small p in the dead wax. Great record! Riverside seem to me to have understood the importance of the sound engineer, up there with the musicians, but completely blind to the importance of the pressing. There is never any consistency in pressing quality. The few American Riversides I have are all over the place. In the UK at different times they contracted Philips, Decca, and some anonymous plant, again no consistency, a sign of “whoever is covenient/ whoever took me to lunch/ whatever…” It is very frustrating because you have what you know is going to be great music, but hostage to whether it is going to sound any good. I have a vinyl reissue of this that I purchased new a few years ago…the vinyl seems relatively weighty and the label and cover are exact copies…of the MONO version, including catalog number and addresses on the cover. Tons of information in the run out – a four digit number, followed by UAJ 14003, plus an additional number on the line below it. No other sign of a different company producing it besides some sort of squiggly signature or something. Listening to it…it sounds nice! A bit dark in timbre, especially Evans…I just recently got a copy of Interplay in mono and I feel he wasn’t recorded as well on this album. Does anyone have any more information on this particular reissue? I suspected the same company that does all the Blue Note vinyl reiusses, but this sounds a bit more dynamic than those. Also…I’m wondering if this is truly a mono pressing, or if the company doing the reissue worked a little too hard to duplicate the original. 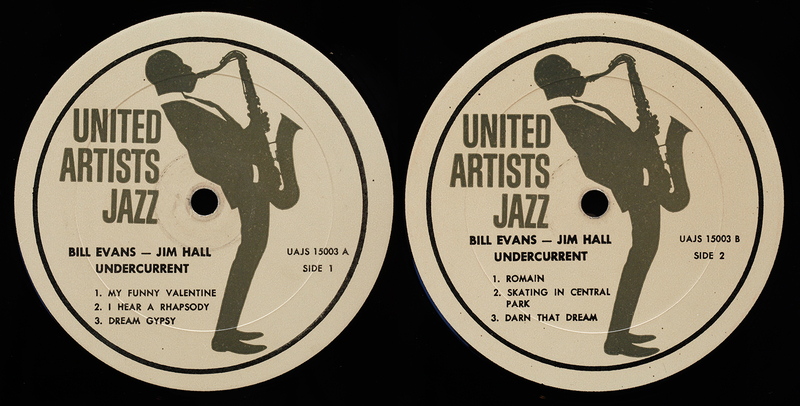 I have two original United Artists Jazz with the grey bendy sax labels. Undercurrent 14003 mono, and Matador – Kenny Dorham 14007 mono. Both have the ear. The copy I was talking about was Duke Ellingtons “Money Jungle”. Sax Player label and ear. But I don’t know if it’s stereo or mono, because the record is tucked away right now. But interesting to see, that there’s a lot more to find and learn. I’m out of town too, till September, so I can’t check Plastilyte. I’ve got the mono, 14003 and confirm the sax player label is the first. there are at least two more interesting numbers with the same sax player label, but are reissues: Charles Mingus Wonderland, UAJ 14005 (original named Jazz Portraits, same number but different cover) and John Coltrane Coltrane time, UAJ 14001 (original on UAL 4014, under the name of Cecil Taylor: Hard driving jazz/ stereo UAS 5014, same leader but different title: Stereo drive). these UA sort of soft touching covers are wonderful. Bill and Jim are at the top: if possible check Skating in Central Park with a MJQ version, UA too. MGM (Metro-Goldwyn-Mayer) purchased Verve from Norman Granz in 1963, and my suspicion is that around that time United Artists entered into some kind of record manufacturing arrangement with MGM (although MGM did not actually purchase UA until 1980). Looking at MGM and (Non-Blue Note) UA pressings from the mid to late 60s, they seem to have similar mastering marks/matrices and both feature very poor quality pressings (your copy of Undercurrent sounds like a typical case). My current theory is that UA kept Liberty’s pressing arrangements in place for a few years after purchasing them in 1965. These are the pressings that occasionally feature the mysterious serrated edge and are usually of very high quality. I don’t know for certain where those records from this period were pressed. I do know that Liberty had relied on the RCA plants for many, many years prior to the buyout and that RCA maintained high pressing quality for sometime (until the Dynaflex disaster, that is). For the time being, I am unable to track down any real evidence of UA records being pressed by MGM. Thanks for the extra input. Respect. Music quality and pressing quality is a connundrum. It is not like you have a choice. Undercurrent was not well pressed. If you want the music you have to accept it. The pressing is not so bad that I want to turn it off. I have the CD, so some critical listening is required. Sometimes you have to accept that the evil silver disc dos a better job than vinyl because of poor quality pressing.Vinyl is capable of the finest quality sound, but if some suit somewhere to save a buck screwed it up, that is how it goes. I am convinced the Liberty/RCA 1966-7 combination produced great pressings. I have many. Where it went after that, who knows. I have what I believe is an original pressing with the Plastylite ear. 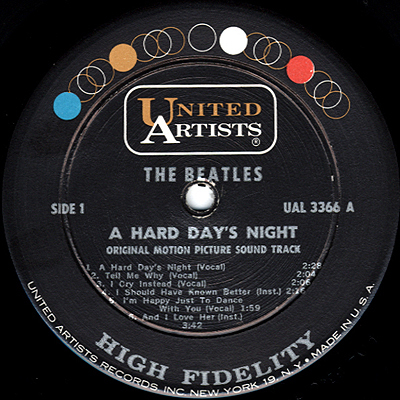 However, I have yet to see any evidence of Stereo pressings with either the original UA label or a Plastylite ear. I’d be very interested if someone happens to have such a pressing. Incidentally, this record was produced by Alan Douglas who went on to release the ‘Iron Man’ LP by Eric Dolphy (which is not, despite the title, a collection of Black Sabbath covers) as well as two somewhat controversial posthumous Jimi Hendrix releases. No party has yet claimed responsibility for the ‘liner notes’. Thanks for that link to the Jazz Collector discussion. I neeed to check my stereo when I get home – I am out in France right now.Next week. I rather suspect the black label UA mono Plastylite may be an anomaly. The day my auction closed, a black label Undercurrent closed at a third of the price of my bendy tenor Stereo. Popsike has many both stereo and mono but no-one has put up the crucial label difference. I suspect my stereo will be earless. I certainly didnt notice one when I shot The Matrix. My issue with UA Jazz is the crap in the grooves. I get similar problems with some Riversides. Too much crackle. Somebody had a dirty pressing plant! Both the mono and stereo Undercurrent claim to be 1962 in Goldmine, and all the UA Jazz were issued in both formats. 14000+ for mono 15000+ I have added a guide to UA Jazz “bendy tenor” series in my label guide. They sure released some interesting stuff! Couldn’t have happened to a nicer Londonjazzcollector! I totally discarded this album the first time around. Thought it was boring slow tempo jazz. How wrong I was. The interplay between the two is at times mesmerizing. This has quickly become one of my favourites. I have a Japanese (King?) pressing from the 70s, but this one sounds much more detailed than that one. I have one United Artists pressing and that features the familiar Plastylite ‘P’. Couldn’t you find it on yours? I am out of town and away from the collection right now, I’d be surprised if I had missed an ear, but often you see what you expect, and I wasn’t expecting an ear so I wouldn’t have been looking for one. But will check on return.